Branded a traitor, his life threatened, Deshapriya sought asylum in Switzerland. Although he continues to write about his home country from afar, Deshapriya knows his stories would be stronger if he was free to be a reporter in Sri Lanka. Over the past five years more than 70 Sri Lankan journalists have fled the country, fearing for their safety. 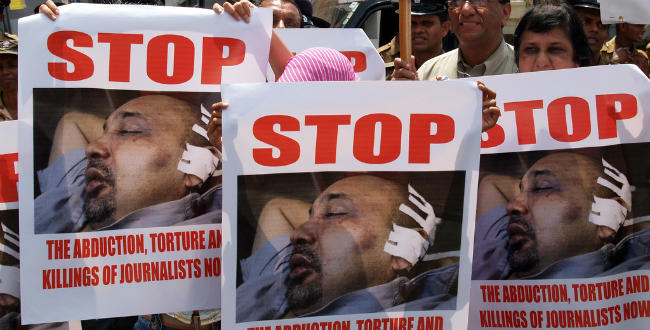 Many more have been threatened, beaten or abducted within Sri Lanka. Thirty-four media workers have been killed there since 2004, and no one has been convicted in any of those cases. Deshapriya says he won’t feel safe going back to Sri Lanka until it’s clear that there is no longer tacit impunity for crimes against journalists. In part, press freedom has been declining in recent years because of the threat of international investigations into possible war crimes committed during the civil war. “The government of Sri Lanka’s paranoia about a free media is – to a large extent – driven by their fear of the international accountability process,” Carver says. The action plan released this week calls on foreign governments and international media to support press freedom where the Sri Lankan government will not. Perhaps more importantly, Carver says, they are asking other countries to make it possible for threatened journalists to apply for asylum while they are still in Sri Lanka. He says many journalists he’s talked with have told him that would help them feel freer to do their jobs well. Sunanda Deshapriya applied for asylum in Switzerland when he was in Geneva in 2009, although he could have applied from within Sri Lanka. But Switzerland is the only country with an embassy in Sri Lanka that accepts asylum applications. The Dutch Immigration and Naturalization ministry – although it gives special consideration to journalists from Sri Lanka – only accepts applications from people who are already in Holland. But Deshapriya says for many journalists, being granted refugee status might not be necessary. But he says he won’t feel safe in Sri Lankan until the government has made it clear that it will not participate in – or tacitly condone – attacks on media personnel. And Deshapriya will only believe that once the culprits in past attacks have been duly tried, convicted and punished. This entry was posted on August 9, 2011 by sd in news and tagged censorship, impunity, media freedom, media suppression, sri lanka.